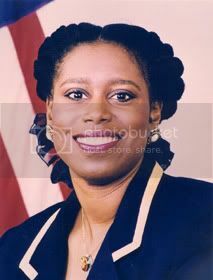 ATLANTA, Aug. 9 (JTA) This time, Rep. Cynthia McKinney will have to blame her defeat on the G-E-O-R-G-I-A-N-S. So says Atlanta Jewish activist Stephen Oppenheimer, referring to the infamous charge by McKinney's father, Billy, who blamed her 2002 defeat on the "J-E-W-S."
Four years ago, a national network of Jews funneled nearly $1 million into the campaign coffers of Denise Majette, who upset McKinney. McKinney then won the seat back in 2004 when Majette opted to run unsuccessfully for the U.S. Senate. One of Congress' most controversial members and a vehement critic of the U.S. alliance with Israel, McKinney lost Tuesday night's Democratic runoff for her congressional seat to longtime Dekalb County Commissioner Hank Johnson, 59 percent to 41 percent. In Georgia's heavily Democratic 4th district, Johnson is virtually guaranteed a win in November against Republican Catherine Davis. In 2002, McKinney was an easy target for Jewish activists, who contributed nearly half of Majette's funds. This year, McKinney's own politics appear to have done her in. Seen as a lightning rod because of her broadsides against the Bush administration, anti-war posturing and race-related incidents, McKinney took a public relations beating this spring. When a Capitol Hill security guard physically detained her, the black congresswoman allegedly punched him, accusing him of racism. A grand jury indictment against McKinney eventually was dropped, but the scuffle did not play well at home, aggravating the feeling among constituents that McKinney was increasingly out of step with their interests, experts say. "The Jews did not make it happen this time. It was the Georgians," said Oppenheimer, a pro-Israel activist who helped fund Johnson�s campaign, and had helped fund past McKinney opponents as well. "She was a poor representative, she was totally marginalized in Washington, she did not add anything of significance to the discussion and did not bring home the bacon." For example, McKinney voted against every defense appropriation in a district located close to the military contractor Lockheed Martin, said Bill Shipp, author of the political newsletter Bill Shipp's Georgia and a panelist on the political talk show "The Georgia Gang." "The growing middle class down there came to the conclusion that she wasn't delivering anything," Shipp said. In large part, McKinney's loss was due to an erosion in support from her predominantly black constituency. She and Johnson, who also is black, split the African-American vote, which makes up some 60 percent of the district. Georgia's 4th district is one of the wealthiest black districts in the country. "Atlanta is the mecca of the nation for African Americans, and you can't be the mecca and be the heart of that mecca and believe those constituents will feel represented by outrageous behavior like the fact that McKinney travels in a Humvee with security guards as if she were a rap star," Republican pollster Matt Towery said. Opposition also came from white Democrats and from Republicans who did not vote in the Republican primary and therefore were eligible to vote in the Democratic runoff. McKinney also suffered from low voter turnout in the primary and increased turnout in the runoff, Towery said. "That was just the perfect storm for a major landslide defeat," Towery said. Jewish activism did play a role, but Jews initially were reluctant to participate in the campaign because they felt badly burned by Majette, who had abandoned her seat just two years after Jews had worked hard to help her win it. For his part, Johnson earned Jewish support by reiterating Israel's right to defend itself against Hezbollah, and simply by not being McKinney, who has called for Israel's nuclear disarmament. At a recent rally for Israel at Atlanta's Ahavath Achim synagogue, Johnson drew sustained applause and a standing ovation. Before the June 18 primary, Jewish money accounted for some $20,000 of the $160,000 Johnson raised. The Jewish contribution for the runoff was about $100,000, about one-third of the new money Johnson raised. In contrast to 2002, most of the Jewish money raised this year was local; nationally, Jews felt too miffed by their past experience in the district and focused on other candidates, namely Democratic Sen. Joseph Lieberman in Connecticut, Oppenheimer said. Furthermore, relations between pro-Israel activists and black members of Congress had been strained by the 2002 pro-Israel campaign to unseat McKinney and Rep. Alabama's Earl Hilliard (D-Ala.) , another black candidate considered anti-Israel, even though the alternative candidates Jews supported were also black. Jewish activists are working to rebuild those relationships, in large measure by thanking the legislators for their pro-Israel platforms, Oppenheimer said. McKinney's conduct in the wake of her defeat only highlighted the deficiencies that cost her the race: On Tuesday night, her camp played an anti-Bush protest song, one of her guards scuffled with a TV photographer and McKinney claimed voting irregularities.